This evening I check in on Port City Community Church’s website. While I was there I became excited after seeing that they had all of their messages on the website in VIDEO form. Check out their site at http://www.portcitychurch.org – I was able to attend all of their “What If” series. In a YouTube world – almost everybody watches video online. Recently I watched Les Moonves talk about local CBS stations complaining about CBS’s Innertube. Innertube allows you to watch full episodes of our favorite CBS shows (basically CSI – are there any others?). Les boiled it down by saying that if CBS was going to survive then they would have to meet people where they are at, even if it takes away people from watching CBS in the traditonal TV form. Some parts of the church world are actually ahead of the game for once, instead of trying to catch up like we normally have to do. 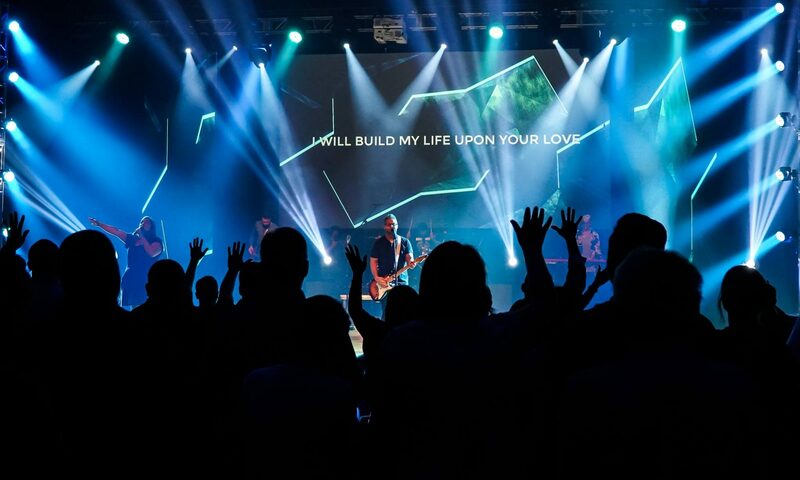 Fellowship Church was one of the first to embed Windows Media Video into their website. This was way before embeded flash video or viral videos even existed. Since lifechurch.tv, Granger Community Church, Newspring Community, and many others have began broadcasting their services on the web. Unfortunately many churches don’t take the step into video and only feature audio clips of the sermon on the website. While Podcast have there place in the world – VIDEO is not the future… its the present. Last week Greg Laurie and his Harvest “Crusade” rocked Raleigh. I was the first in line at the RBC Center on Friday night because the AWESOME David Crowder Band was performing that eveing. It was a very good night in Raleigh. DCB did their classic set which rocked the house. The Harvest people all ready have the webcast archieved on the harvest.org webiste. Go ahead and check it out now, and I will give a full review later. As I was surfing around on the net I stumbled upon some backstage pics of Newspring Community Church in Anderson, SC. I found them at Anthony Coppedge’s Blog – Thanks Anthony! Keep up the great work. Craig Tackett Finnally Got his Braces Off! As I was surfing around the net I stumbled upon www.inlightenedministries.com the web home of Craig Tackett and The Johnathan Project. They are an awesome ministry that I have worked with, mostly doing events in the Jacksonville, NC area. As I checked out their new website I noticed that Craig no longer has braces. I am sure that he has had them off for a good while, but I feel honored to say I knew the braced Craig Tackett. Craig and his crew do something awesome. They go into the most traditional acting and looking churches (especially ones with really bad carpet – I think only Craig would get that), and bring a creative and energetic presentation of the gospel. What does this do? It brings people to Christ. For more on their ministry and ways you can support them – check out www.inlightendministries.com/support! I think my last two songs come from having XM Radio’s Top 20 on 20 engraved into my mind at work. They might sound annoying at first, but they can get rather addicting. I think Google is about to take over my life. My Mac had taken over for the longest time, but now it seems that my homepage will be controlling my life now. With the advent of iGoogle my homepage is truly customized to me. I started by just adding my Gmail to the homepage and stuff like “famous optical illusions. Then I discovered both Google Calendar and Google Reader. Both of these apps integrate seamlessly into my homepage. I also use Google Products (formally froogle) at Circuit City to figure average market prices on cameras and camcorders. What will Google do next? Newspring Church in Anderson, South Carolina has become an inspiration to me with their weekly services provided in streaming video on their website newspring.cc. They continually amaze me with their pastor’s enthusiasm and passion to go big. Plus they were the closest church to me that used worship sets and intelligent lighting in their worship experiences until I found Port City Community Church in Wilmington, NC. Perry Noble, their senior pastor, used a Monty Python clip before his message but unfortunately our web people only saw the series bump. So that made me wish I was actually there. He started the service off with a prayer, which in most churches is considered an invitation, but invocations don’t traditionally happen in untraditional churches. I found it to be very powerful and started the service off powerfully. Following it with powerful modern worship music created an awesome and inspiring service. This is an excellent example of how Emerging Churches have to always be changing. Change is very effective, and if it doesn’t happen even the most modern church will began to feel stale like the dying traditional churches across America. Great job Newspring on another amazing service.